As the product lead for Redbooth’s new multiple assignment feature, I’m happy to say that we’ve completed the beta testing process. If you’re a Redbooth user, you can start using this helpful new feature today! We created multiple assignment because of what we were hearing from you, our customers. In our research and our customer interviews, we’ve been hearing that collaboration isn’t simply about passing work back and forth. In a collaborative environment, team members have shared responsibilities. Sometimes everybody has a piece of a certain task and is responsible for it. Other times, you might have a single task that multiple people each need to complete on their own. Redbooth’s new multiple assignment feature gives you that flexibility. It makes the whole process more efficient for you. Let’s take a look at three cases where you might find it especially useful. Use case #1: Fill out your timesheet, people! We hear this one a lot from managers and admins. You need to assign certain routine tasks to lots of people at once, like updating a timesheet. 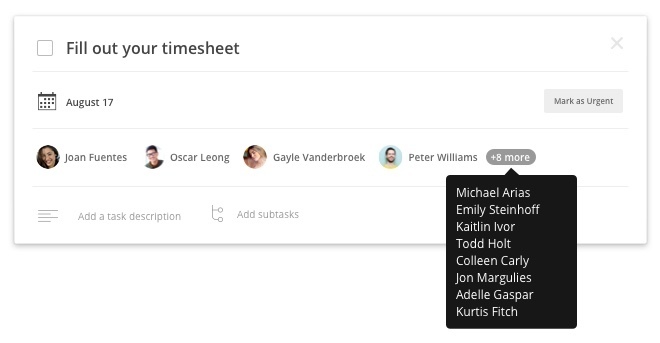 If you have 12 people who need to fill out their timesheets, that means you’ve also got 12 separate tasks. At a certain point this becomes challenging to manage. Imagine you have three kinds of tasks like this: timesheets, signing up for the potluck, and putting in your request for the next employee offsite. Now you’ve raised the noise by a factor of three. Rather than creating a separate task for each person and assigning each one individually, simply create a single task. Then you can assign it to all the people who need to complete it. It’s great for follow-up, too. You can simply go to the task to give and get updates, and to communicate quickly and easily with all 12 people who have been assigned the task. The second use case that we’ve heard quite a bit about from you is especially popular for creative services. In this case, there’s a deliverable being produced and many key people are involved. For example, on a new web page, you’ve got a designer, a copywriter, a developer, and maybe even a UX person, an SEO consultant, and more. Ultimately, we’re talking about shared responsibility. That means everyone involved is directly accountable. To keep assigning it back and forth doesn’t really make sense in this case, especially when work can overlap. For instance, the SEO consultant can be doing keyword research while the designer works on mockups. It’s no longer a linear process. You’re frequently working in parallel. That means you need a model that supports parallel responsibility for the outcome as well. Do keep in mind that you still have the “watchers” feature in your Redbooth tasks. So if someone who’s not directly involved still wants to stay in the loop, he can be added as a watcher. He’ll still receive updates but won’t be responsible for completing the task himself. This is especially useful for clients who may need to see updates and progress of a deliverable. Finally, there’s a third case we’re excited about addressing. It’s particularly common for development shops and marketing agencies. In this case, there’s a lead — a person who is primarily responsible for driving the task to completion. At the same time, there are key stakeholders who need to work concurrently. When you look at a task, you can tell who has primary responsibility as a lead. The first person on your assignee list is always going to show up first. When only one image displays (like in workspace view or Timeline view), that image will be the first person on the list. You can scan and see at a glance who’s fundamentally responsible for the task, even when there are multiple assignees. If want to change the order of your assignees to make someone else the lead, it’s simple — just drag and drop them to move them to the front of the list. Our customers are growing and evolving, and their workflows are evolving along with them. We think it’s very important for Redbooth to grow and evolve too, so that we can keep enabling our customers to get more done and work more efficiently. Projects like multiple assignment are exciting for everyone involved here, from product to development to design, because we’re solving real problems and delivering helpful solutions. Above all, we’re keeping Redbooth flexible, so that you have the freedom to use it with your teams in the way that works best for you. When you’re using Redbooth and you have a thought or idea about the product, we want to hear it! Just click on the question mark at the top of your dashboard in Redbooth and click on “submit an idea.” That will take you straight to our customer feedback forum. Our product team reviews all of the ideas that get posted. Even if we can’t respond to every idea, we read every single idea that gets shared there. We learn so much from the ideas that you share. We look forward to continuing to be responsive and make Redbooth something that brings you more and more value every day.